Special open registration for our UCSB Alumni: Sign up and help promote UC Santa Barbara with best and the brightest prospective students this March at the Chancellor's Reception in San Jose. 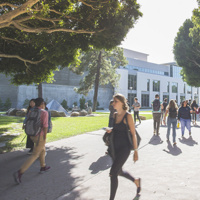 We need our alumni advocates to convince this next generation of college students to make the best decision of their lives: choosing to study at our alma mater UC Santa Barbara. Student Mingling: 12:00 -1:30 p.m.
RSVP by Wednesday, February 20, 2019, at noon.